Small ring approximately D-shaped, with heavy bars consisting of a short, cy1indrcal median bar, a straight cylindrical vertical bar which ascends ventrally at a low angle, a three-bladed superior bar with an approximate right angle bend, and a straight, vertical, three-bladed apical bar. Six primary basal spines generally present; the primary lateral spines, thin, conical, of variable length; axial spine represented by a short stub; dorsal and secondary lateral spines of variable development, the former generally heavy, three-bladed to conical, relatively long, the latter usually conical but three-bladed in a few specimens and of variable length. Ring characteristically with 2, in a few specimens 3, long, heavy, divergent, three-bladed spines arising from the two upper corners of the ring as well as from near the distal end of the vertical bar; spines at each of these three nodes lie in a plane perpendicular to the plane of the ring, all three planes approximately radial outward from the center of the ring. A short thorn-like vertical spine, long, thin, and conical in a few specimens, extends from the vertical bar; apical spine extends from the apical bar, variable from thin and conical to heavy and three-bladed. Measurements; based on 23 specimens from stations 71, 92, 93, 115, and 133: height of ring 29-52 µm, maximum breadth 23-39 µm; length of vertical spine 4-38 µm, of apical spine 4-48 µm, of dorsal spine 7-28 µm, of secondary lateral spines 10-30 µm, of primary lateral spines 5-15 µm, of maximum corner spine of the ring 23-68 µm. Remarks. No illustration of this species was found in the literature. Zygocircus piscicaudatus Popofsky (1913, pp. 287-288, Pl. 28, fig. 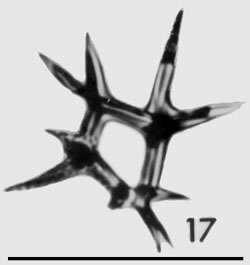 3) from the equatorial Atlantic resembles this species most closely except that the accessory corner spines are much shorter, there is a webbing of silica between the spines, and there is a dorsally extending spine arising from the mid-point of the apical bar. This species is rare in the Gulf; therefore, its complete range of variation was not studied. Specimens similar to Popofsky's species may be found to intergrade with the Gulf forms. For this reason a new species name was not proposed. Distribution. This species is very rare in the Gulf. It occurs only at stations 34, 46, 60, 64, 81, 91, 92, 93, 106, 115, 133, and 191. It occurs throughout the Gulf and, therefore, is to some extent cosmopolitan. It is generally confined to the axial portion of the Gulf and does not appear to be associated with upwelling.